When it opens in Jackson Park, the Obama Presidential Center will be an unprecedented point of convergence between past, present, and future—a museum to celebrate the Obamas’ historic path to the presidency, a home for civic and community engagement, and a place where people are inspired to create change. It will be a place where students and teachers, tourists and neighbors, history-lovers and nature-lovers can meet, share ideas, and learn from one another. The Museum will serve as a home for a one-of-a-kind collection that inspires visitors and spurs them to make change in their communities and the world. The Forum, largely built into the undulating landscape of Jackson Park, will house numerous collaboration and creative spaces, including an auditorium, multipurpose meeting rooms, a recording studio, a winter garden, a test kitchen, and a restaurant. The Plaza will be an open and flexible space, with the ability to host large and small community events alike. A Children’s Play Area and Great Lawn will offer a fun, safe environment for all ages and all seasons. The Program and Athletic Center will be a multi-purpose facility that will host a variety of programs for the public including presentations, events, athletics, and recreation. The Center’s library will be an actual public library—a first for any presidential center. As a 5,000-square-foot branch of the Chicago Public Library, it will house a multimedia collection with a focus on civic engagement and conduct programming to engage community members. The initial vision for the library includes spaces for reading and study (including homework help) that can be converted to open seating for programs and events; a dedicated children’s area and a space for a program called YOUmedia, which lets teens explore the world and their own creativity using new technologies; and meeting space that will be available for public use. Adjacent to the library, we plan to include a special collections reading room, which may host a rotating series of small exhibits. From the beginning, the Center was designed to be accessible to everyone. Ramps and elevators will allow for universal access to the Campus, and we’re thinking creatively about how to make the Campus welcoming for all, including those with physical and cognitive disabilities. We’ve also taken into account Chicago weather: the three main buildings will be connected by underground tunnels that will let in natural light and offer comfortable access throughout the year. We selected Tod Williams Billie Tsien Architects to bring the Obama Presidential Center to life. The architects, who were awarded the National Medal of Arts in 2013 by President Obama, carefully considered how the Center will engage with the light, land, and community around it. They elected to partner with local firm Interactive Design Architects to ensure that their design would be rooted in the values and history of the surrounding neighborhoods. The design of the museum building is inspired by four hands coming together as one. Each of the façade’s four sides are different, illustrating that it takes many hands, from many backgrounds, to shape a place. The Museum’s ticketed core exhibits (levels two through five) will present President and Mrs. Obama’s story and the narrative of the Obama Administration in a broader historical context. 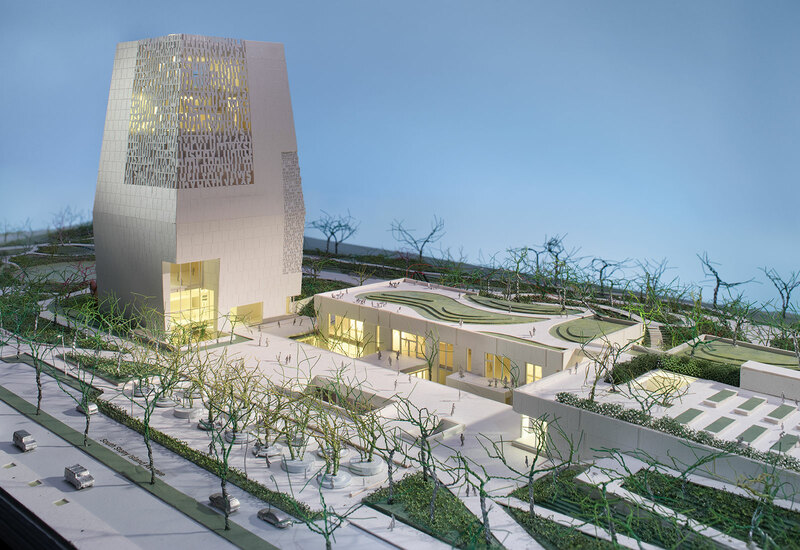 Drawing from African American history, the history of civil rights, and the powerful place of Chicago in American history, the Museum will frame the movements and milestones that helped to shape the nation over time. The Museum will collect materials on an ongoing basis and in a wide range of media: 3D objects, prints, photographs, paintings, manuscripts, books, textiles, and ephemera. The core collection will feature presidential artifacts from President Obama’s eight years in office that are held by the National Archives and Records Administration (NARA). Additional materials from periods pre- and post-presidency, as well as non-White House material from 2009 to 2017, will complement the documents and artifacts collected by NARA. The Plaza level and part of the Garden level of the Museum building will be free and open to the public to gather and explore artwork on display, as well as interactive exhibits and programs. The Sky Room, an observation and reflection space on the eighth floor of the Museum building, will also be free and open to the public. This space will invite visitors to contemplate their connection to the broader community and their roles as active citizens and offer spectacular views of Lake Michigan, Jackson Park, and downtown Chicago. The rotating program of exhibitions in the Temporary Exhibition Gallery will provide an opportunity to expand upon and investigate further topics or historical moments highlighted in the core exhibits. The temporary gallery will foster partnerships with other cultural institutions and encourage repeat visitorship. The Museum will be accessible in a range of ways for all visitors regardless of age, physical ability, or learning ability. Throughout the exhibition design process, we will align the Museum’s core exhibits and interactive programs with the latest principles in universal design and accessibility. Jackson Park is on the National Register of Historic Places. It was envisioned by Frederick Law Olmsted and Calvert Vaux—the designers of New York’s Central Park and Riverside, Illinois—as one of the gems in a vast South Park system. 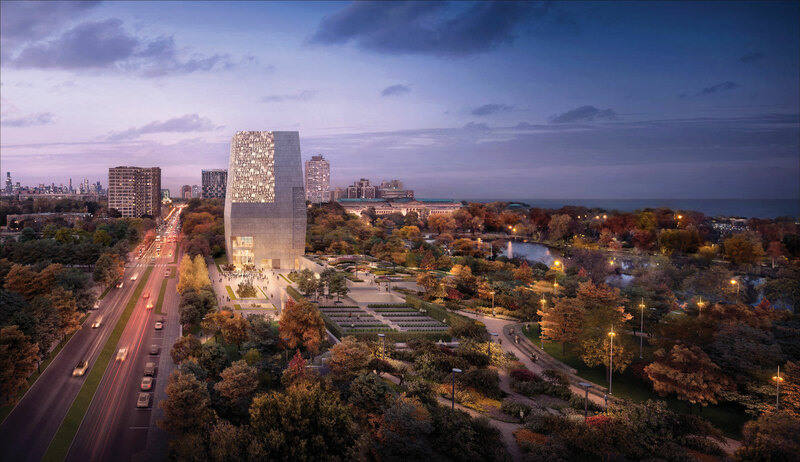 In developing the landscape plan for the Obama Presidential Center, we have partnered with landscape architects Michael Van Valkenburgh Associates (MVVA), and are drawing on Olmsted and Vaux’s original design ideas and principles. MVVA leads the landscape architect team in partnership with Site Design Group and Living Habitats, two Chicago-based firms. The Great Lawn will be positioned to face the lagoon and welcome visitors from within Jackson Park. With winding paths, gentle hills, and a new tree canopy, the field element will be the perfect year-round space for sledding, picnicking, gathering, playing, and relaxing. 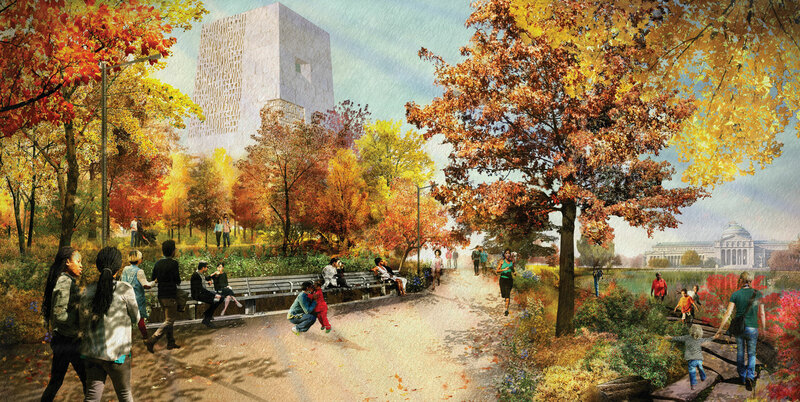 The park’s wooded areas will connect the Lagoon with the park’s western edge, where the noisy six-lane Cornell Drive currently stands. It will encompass the top of the Forum building, be home to a children’s play area, and remain a peaceful place for bird watchers. Jackson Park’s lagoons and proximity to Lake Michigan are central to the park’s original design, and we’re preserving and enhancing many of the existing spaces. Selection of native water-loving plants and specimen trees will be guided by the Great Lakes Fishery and Ecosystem Restoration Program. As we continue to write new chapters, we want to make sure you don’t miss a word.